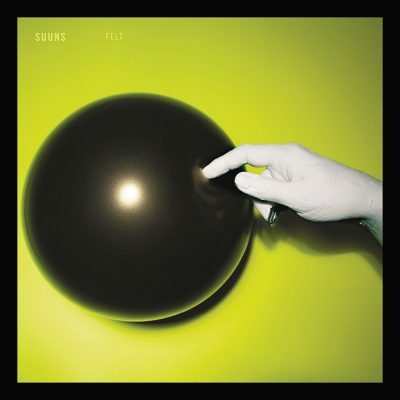 Suuns have always stood in their own realm between noise, post-punk and dance with a dark and isolated dystopian vibe. Their experimental style evolves with each album, but with the upcoming Felt, the band is in an around-the-world scenario that finds them in a more playful mood than that of the rest of their work. Their attraction, at times, to cold and unwelcoming rhythms that deny the listener a sense of connection has largely given way to a warmer, if still undanceable, sensation. Their world remains bleak and dark, but it feels less like the band is hidden in a maze of dark alleyways and more like they’ve moved to some tucked-away venue where the crowd dances together while still being completely alone. The tone for this starts with the opening track, “Look No Further,” where boozy percussion drawls behind singer Ben Shemie as he evokes primordial scenes of rock, clay and myth. It’s a stark progression from their past as an alienated and alienating force. The aesthetics of the sound have become more palatable without becoming commercial. Something else the band plays with is the percussion of the album: some solid house rhythms that fit well into their new style. It lends itself to the “club collective buried in the slums of the future” mindset they’ve placed themselves in. It’s not as if they’re adding anything particularly new, instrument-wise, to their repertoire. Instead, their experimental nature has led them to fresh, new grounds that demonstrate that they still have room to explore. They certainly haven’t given up their outsider status: Their sound is uniquely their own, but their wandering sound has brought them closer to what other artists are already doing, which gives them an approachability that may have been less apparent before—all without sacrificing the arena they’ve been harvesting from for years. One thing they try out on a few songs—which is a little more hit-or-miss—is their use of autotune. In more than a couple songs, the vocals are drenched in this pop cliché. At times, it seems to work: “Materials” is entirely autotuned, and it’s one of the groovier tracks with a southerly, minimalist approach. Unfortunately, on other songs, it can seem a little grating in its disconnect with the rest of the band’s elements. To be fair, this doesn’t take away from the album much. The nature of an experimental group feeling their way through uncharted territory almost demands that not everything is going to be a polished gem of a track.